Dallas Arboretum Family Fun Weekend! Special Discount, Activities For The Whole Family! You are here: Home / Dallas/Fort Worth Events / Dallas Arboretum Family Fun Weekend! Special Discount, Activities For The Whole Family! The Dallas Arboretum and Botanical Garden announces the annual Family Fun Weekend on October 23 – 25 with a special discount and fun activities for the whole family. 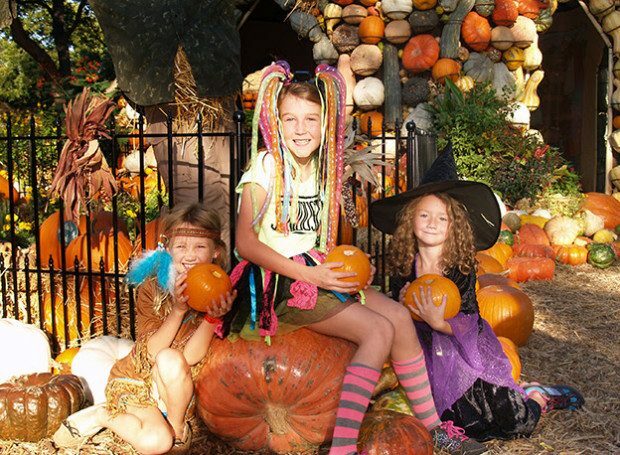 Guests will enjoy strolling through the nationally acclaimed Pumpkin Village and surrounding displays featuring 75,000 pumpkins, gourds and squash that create one of “The Best Fall Festivals to Celebrate the Season” according to MSN.com. The Pecan Grove will feature fun-filled activities for children of all ages, Saturday andSunday from 9 a.m. – 5 p.m. Guests can trick-or-treat through the garden with costumed characters, and a professional photographer will also be available to shoot fall family portraits from 12 – 4 p.m. in the Pumpkin Village. The professional photography is an additional cost. The Family Fun Weekend discount is fun for the whole family, as adults dressed in costumes pay children’s admission prices on Saturday and Sunday, October 24 and 25. Special this year, on Friday, October 23, guests can start Family Fun Weekend early with a Wild Kingdom Animal Presentation in the garden. From 1:30 – 2:30 p.m., guests can join Wild Kingdom host Stephanie Arne in Pecan Grove for an up close and personal look at some species that share the wild kingdom with them. Mutual of Omaha’s Wild Kingdom uses a knowledgeable host and field correspondents to guide viewers through close encounters with wildlife and wilderness. In the Rory Meyers Children’s Adventure Garden, family fun continues with a special Halloween Monster Molecule Mist Lab starting on Saturday, October 24 at 11 a.m., 1 p.m. and 3 p.m. Guests will make a putrid potion of magical matter that shifts from a solid to a gas. A twist on trick-or-treating, guests can go Sticker Treating on Saturdayand Sunday, October 24 and 25 in the Children’s Adventure Garden. Guests are invited to wear costumes and discover the spooky side of nature, exploring the gardens in search of the next sticker or adventure at each station. All family fun activities are included with cost of general garden and/or Children’s Adventure Garden admission. Wild Kingdom Animal Presentation, Friday, October 23, 1:30 – 2:30 p.m.
Family Fun Weekend, Saturday October 24 through Sunday, October 25, 9:00 a.m. – 5:00 p.m. Guests will not want to miss a fun-filled weekend with so many activities for the whole family. All activities are complimentary with the cost of general garden admission.